There has been considerable debate about the metrics used to define performance in the smartphone industry. Because of the regionally fragmented nature of distribution, some view global market share figures with cynicism. My argument was that market share patterns by country could give us a better understanding of these trends. While market share of shipments is certainly a leading indicator for install base (and consequently, usage), it only gives us a part of the story. Contrasting regional market share and usage share (as a proxy for install base) may give us an even better understanding. As always, I've sourced the figures for shipment market share from Kantar while usage share figures are from Statcounter. Usage share (or browsing share) isn't an ideal proxy for install base as it could be skewed towards higher end devices. 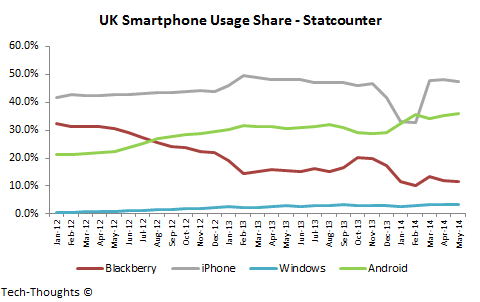 However, the trends in usage share could give us a fairly good understanding of the underlying install base. For example, the chart above shows that Android's usage share has been growing while that for the iPhone has declined slightly. This should be expected as Android's shipments and install base have been growing much faster than those for the iPhone. The market share chart shows that AT&T's foray into unsubsidized smartphone plans in late-2013 had a measurable impact on the iPhone. As a result, the iPhone has seen steep YoY market share declines. 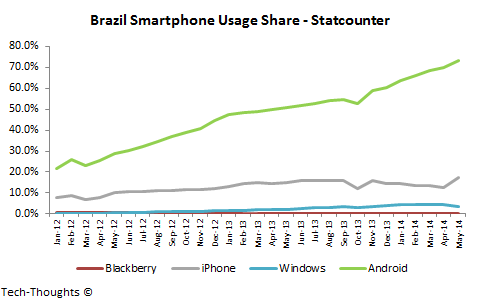 We can see this pattern in the usage share chart as well. Android and iPhone usage patterns were diverging until late-2013, when they began to converge again. 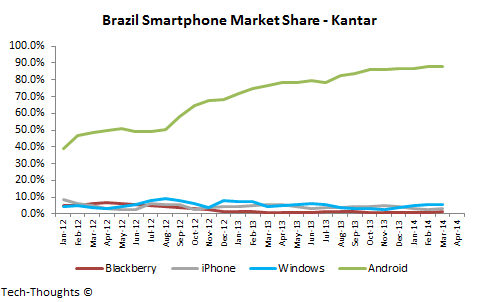 Meanwhile, both charts show that Windows Phone has been unable to penetrate the US market. 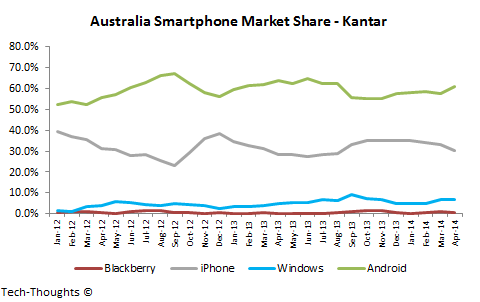 Android has held the market share lead in a fairly cyclical market for a few years now. 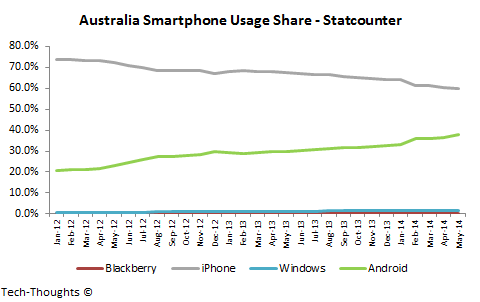 Over this period, it has made steady gains in usage share. 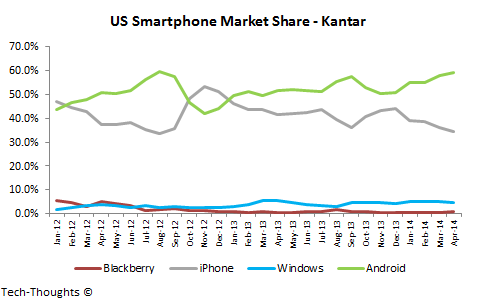 Windows Phone's market share has been hovering around 5-7% for a year now, but it has barely made a dent on usage. This could mean that Windows Phone devices are being used as feature phone replacements. As I've explained before, Japan is one of the only remaining markets in the world that follows a purely opaque pricing structure for smartphones. This pricing model, combined with a distribution partnership with NTT DoCoMo, gave the iPhone a huge market share boost. As we can see, this has had a major impact on iPhone usage as well. As I've explained before, market share patterns in the UK seem to be stabilizing with lower cyclicality. 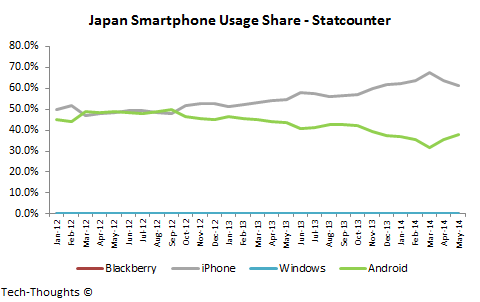 Usage share patterns have remained stable as well, with Android gradually catching up with the iPhone. 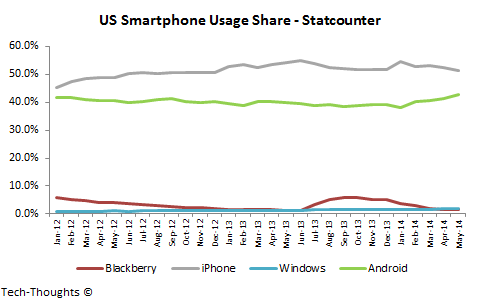 Interestingly, Blackberry owned a significant share of usage even after 2012 but Android gradually ate into its base. 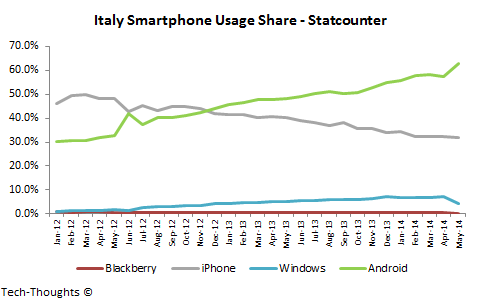 Windows Phone remains a bit player, but at least its usage share doesn't scream "feature phone replacement". 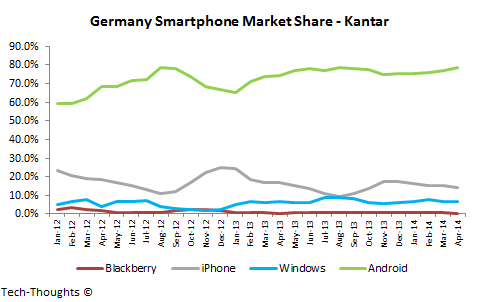 Android's market share in Germany has grown steadily over the past few years. 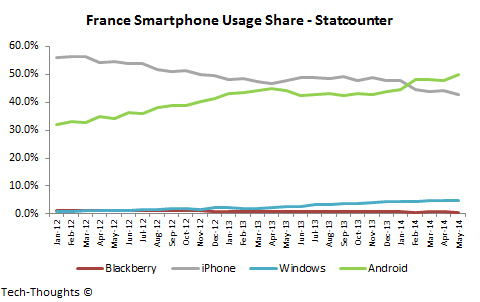 As a result, its usage share overtook that of the iPhone in mid-2012 and now holds a dominant position. This had a significant impact on the iPhone's performance. 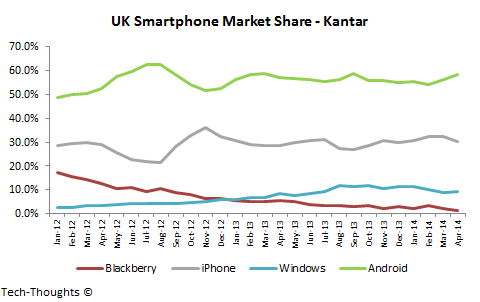 Windows Phone's market share has hovered at around 7%, but it has struggled to make an impact on usage. 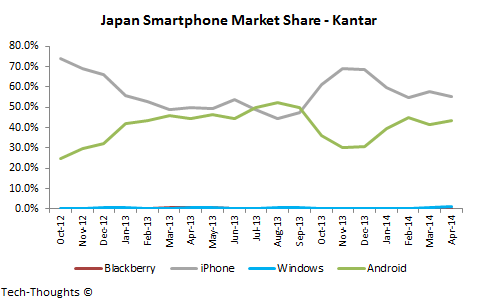 Android's market share has remained stable over the past year, while the iPhone has remained cyclical. Android's shipment supremacy has led to a direct impact on the install base which caused Android's usage to overtake the iPhone's earlier this year. 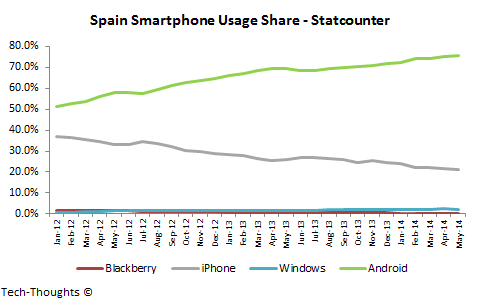 Meanwhile, Windows Phone's market share seems to have had a meaningful impact on usage. 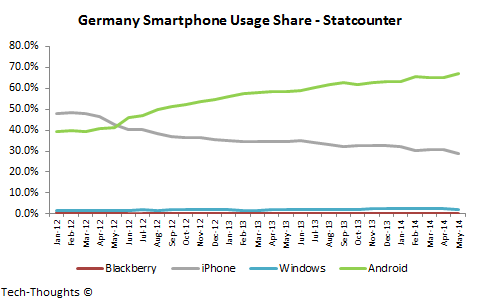 As in Germany, Android has made steady gains to become the leading platform in both market share and usage. 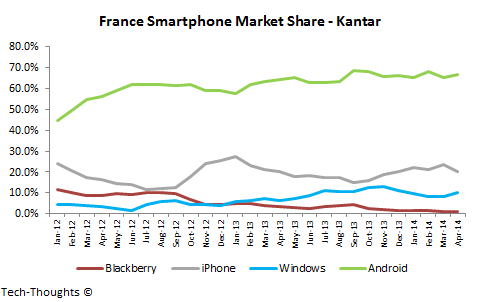 The iPhone has seen steep declines on both metrics as was also challenged by Windows Phone. 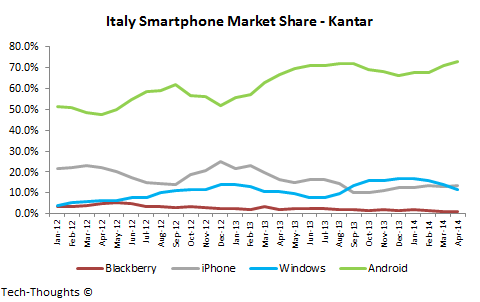 However, Windows Phone shipments, and consequently usage, have tailed off over the past few months. 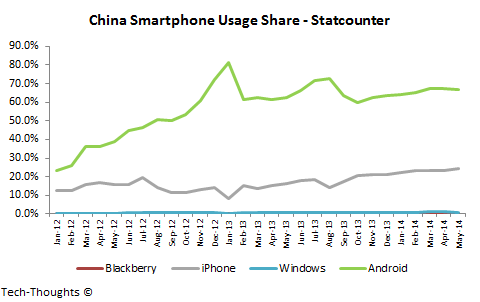 Market share patterns in China have stabilized as the market seems to have moved out of hyper growth. Over this period, Android and the iPhone have feasted on legacy platforms like Symbian. As the market matures, we may see more direct competition between these two platforms. 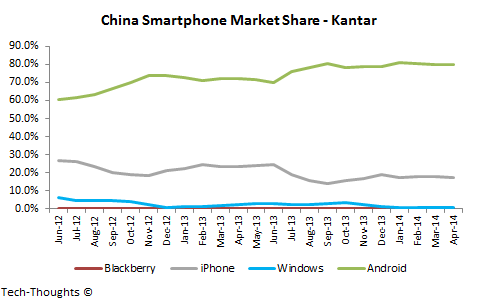 Interestingly, the iPhone's partnership with China Mobile seems to have had no impact on these patterns. 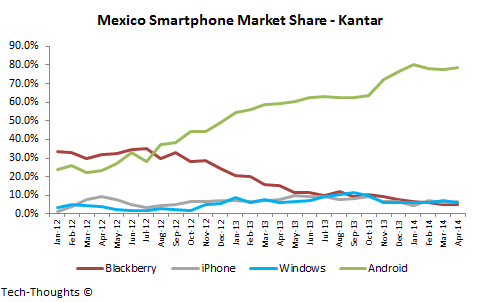 Mexico is the only market on this list where Blackberry held a market share lead at some point in the last two years. However, this market share lead did not translate into usage which suggests that they were primarily used as feature phones. 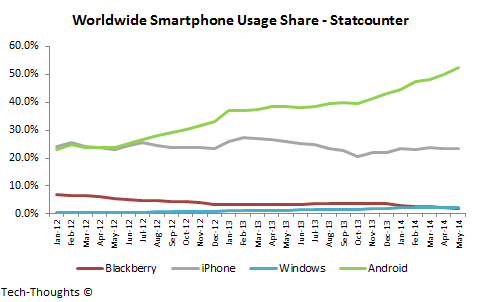 Over the past couple of years, Android has taken a dominant position in market share and usage. The iPhone's share of usage has declined over time, but still seems out-sized compared to its market share. Finally, Windows Phone seems to have a measurable, but not significant, presence on both metrics. 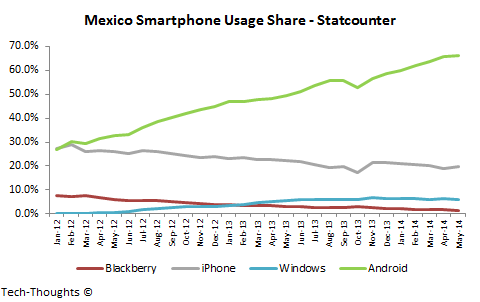 As in Mexico, Android holds a dominating position in both market share and usage while iPhone usage remains far higher than its market share. 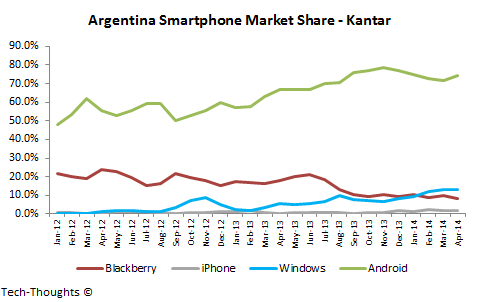 Windows Phone has a small presence, but it seems muted compared to other Latin American countries. 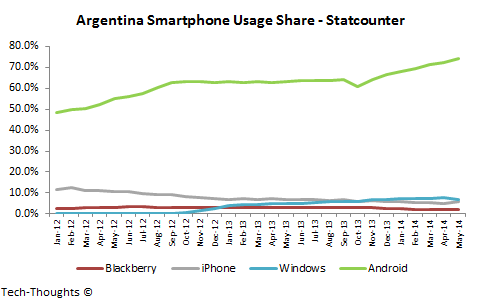 Android's performance in Argentina seems to be dominant enough to create an oddly stable usage share pattern. 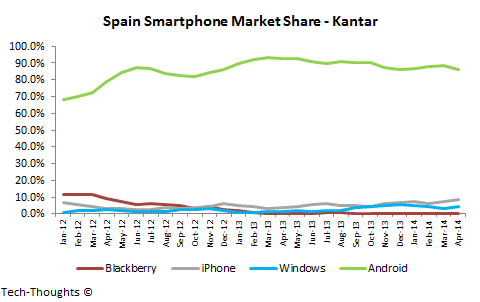 Windows Phone is the second leading platform on both metrics, but remains far behind the leader.